Spring Boot has a useful feature for providing a global error page based by status code by placing an html file named with the status code in your static resources. There are a lot of ways this could be handled, you could jump through a lot of hoops rewriting all your urls. You could utilize Spring ResourceTransformers. You could ensure *everything* for headers/footers/and the like are all pulled in as templates (or god forbid copy them and maintain them in two different locations). Because the project I'm working on already utilized the processhtml grunt plugin, I decided to just add additional targets for each of my error pages. It goes without saying to adjust your build output accordingly, just ensure that the error directory ends up in a Spring Boot recognized static resource location. What we are doing is removing the ui-view div for our main app here when we are building an error page, but pulling in content for our various error statuses. This gets us most of the way there. But what if your app is served under a sub directory? What if the 404 is on some nested path. Now we will force all links to images/js/css/etc to go back to our main app. This is kind of a dirty hack. But now we can maintain our entire app within one source file. I think this is good enough. Automatically syncing up your project reports, javadoc and groovydoc, README.md markdown, and github page with gradle and travis-ci. I've been working on trying to start a *very* simple open source library, but quickly found that I don't want to spend a bunch of time keeping all my docs and websites for it in sync. I'd much rather make a quick README.md file that describes everything, and let my build system do the rest. But I still didn't want to have to copy my site output manually and commit to the gh-pages repo. If I just commit my changes, it should just automatically publish right? To bridge the gap between the maven site publishing and github pages, I leveraged a bash script in my travis-ci build. Below is the script I wrote. Note, I'm dumping all output from the actual git push to /dev/null to protect exposing the github api key in case of an error. For an example, check out my project page at http://aweigold.github.io/lemming/ and my source at https://github.com/aweigold/lemming. Today I had a junior developer come to me in a panic. He needed to provide a full report of all the security roles required for every endpoint in our services, to verify against requirements. His (valiant) attempts to grep the codebase were producing unreadable results, and we had an unexpected deadline of "now!" Obviously, you'll need to update this if you do any configuration in XML, have Security annotations further down the stack, or use RequestMapping annotations at the class level. But the point is, the Groovy console in IntelliJ is your friend for quick one-off projects. So I came up with this solution. Assuming your IDE is running your run configuration in your source root, you can create Spring resource handlers relative to that directory. The gist below shows. IntelliJ Idea, JUnit running, and "non Make" build steps. IntelliJ Idea provides some really awesome JUnit runners that allow you to right click test methods, classes, and packages, and quickly run/debug them. The default JUnit configuration runs Idea's "Make" prior to running your test. This however becomes incredibly painful when you have separate build steps, such as generated sources (protobuf), bytecode manipulation (jibx), etc. Although you are able to change default settings for the JUnit runner, these default settings are stored in the project workspace file, which shouldn't be checked into source control when working with other teams. IntelliJ will detect default run configurations placed in the ipr, however, it will immediately remove it and place it in the workspace file... again, another conflict for source control. This is where the Gradle idea plugin can come in. Since all of the custom build steps should come in after running the "testClasses" target (pending your are running a Java project... it's up to you to figure out other project types), one can add a Run configuration to run testClasses, and then make the default JUnit configuration depend on that run configuration. When running Tomcat on Windows, it is useful to run it as a service using a service account that has permissions to your SQL database so that you do not have to keep your credentials in a config file that can be compromised. 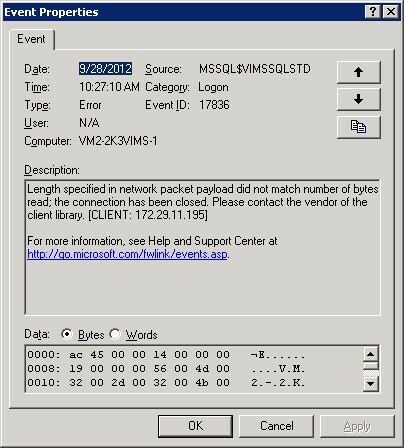 I ran into a problem where my service was unable to authenticate against a SQL instance running on Windows Server 2003 from a system running Windows Server 2008. It didn't seem to matter if I was running jTDS or the Microsoft provided JDBC drivers. 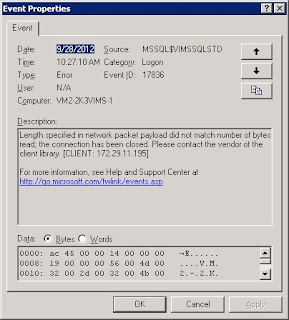 "Length specified in network packet payload did not match number of bytes read; the connection has been closed. Please contact the vendor of the client library." 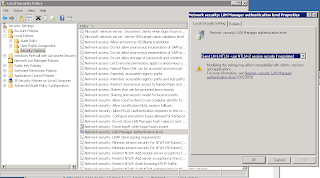 When running a vanilla installation of Windows Server 2003, the server will not be able to support NTLMv2, where on a vanilla installation of Windows Server 2008, it will not drop down to NTLM. 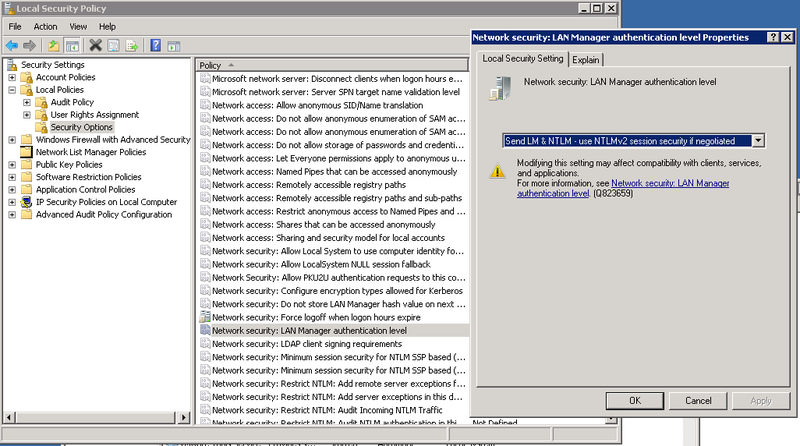 Go to Local Security Policy (or set it on your domain), and under "Security Options", you will find "Network security: LAN Manager authentication level" with a default value of "Not Defined". Change it to "Send LM & NTLM - use NTLMv2 session security if negotiated". Click apply, and restart your service, and you will have database connectivity via Single Sign On Windows Authentication. Update: This will not work with Spring 3.1. This is due to the ServletRequestMethodArgumentResolver being added by default prior to custom argument resolvers in a private method in the RequestMappingHandlerAdapter (getDefaultArgumentResolvers). When using Spring Security, the CommonsMultipartResolver will not work. Why? Because the MultipartHttpServletRequest will be wrapped in a SecurityContextHolderAwareRequestWrapper, and will not be matched. Of course, we don't want to fall back to just taking an HttpServletRequest as a parameter in our RequestMapping and parsing it out, we need to work smarter than that! The best solution I could come up with is registering a custom WebArgumentResolver (below). But any readers out there have a better solution, please share!